Karen Boone and Boomer at Lake Somerville. This bridge now has railings! 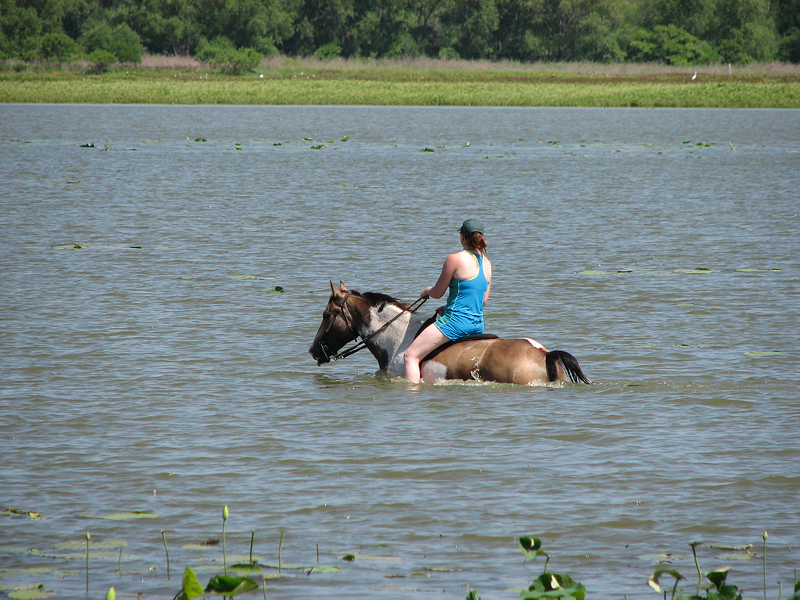 Thanks Karen for providing this picture and the original review for WTTA of Lake Somerville! Lake Somerville is centrally nestled between Austin and Houston. There are two different trailheads at this state park, the Nails Creek Unit and the Birth Creek Unit, which are at opposite ends of the Lake Somerville Trailway. From Houston take US 290 west to Burton (Go through Brenham) Exit at Spur 125. Stay on 125. Turn left on FM 1697. Stay on FM 1697 to FM 180. Turn right on FM 180, FM 180 will go directly into the park. From Austin take US 290 East to about 6 miles East of Giddings. Turn left on FM 180, FM 180 will go directly into the park. From Houston take Hwy 290 West to Brenham. Take SH 36 North through Somerville to Lyons. Turn left on Hwy 60. Travel approximately 8 miles. Turn left on Park Road 57. Park is 4 miles on Park Road 57. From Austin (North) take Hwy 290 East to Hwy 21. Left on 21 Approximately 30 miles. Right on FM 60, 11 miles to Park Rd 57. 4 miles on Park Rd 57 to Park entrance. From Austin (South) take Hwy 71 East to Bastrop. Hwy 21 East approximately 45 miles. Right on FM 60, 11miles to Park Rd 57. 4 miles on Park Rd 57 to Park entrance. 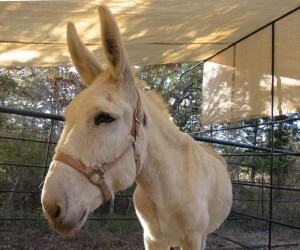 Overnight Camping with your horse is allowed! Reservations: If you want to camp overnight it is highly recommended you make reservations ahead of time, especially if you want a space at Bent Tree in the Nails Creek Unit as it tends to fill up fast. Call (512) 389-8900 or go online: Texas State Parks Online Reservations to book your camping reservation. Nails Creek Unit, Bent Tree water/electric equestrian campsite. 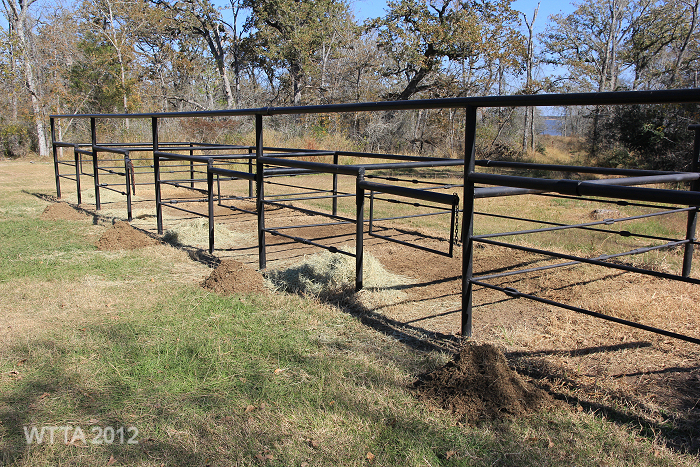 Pair of side by side pens at Bent Tree in the Nails Creek Unit. Nails Creek has 20 equestrian sites with water and electric hookups located in the Bent Tree Loop Equestrian campsites #21 to #40. The majority of these sites have a pair of side by side pipe pens which appear to be about 12 by 12 in size and share a center divider. 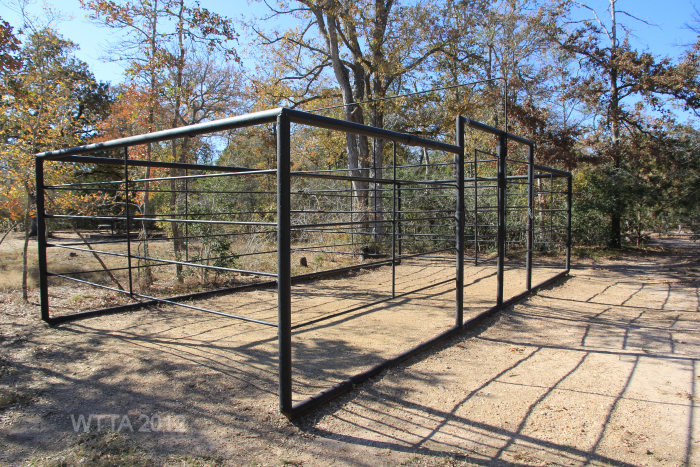 These pens also have a tall center pipe in which a tarp can be attached to provide shade or protection from the rain. So be sure and bring plenty of bungies and a tarp. A few of the sites are located at the ends of one row of several connected pens. 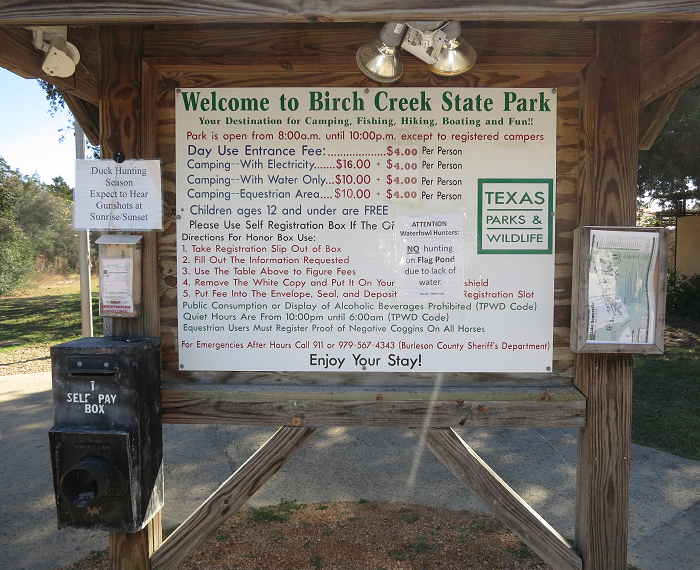 I noticed three separate rows of pens at Bent Tree, one row consisting of about 10 side by side pens and two rows of about five to six side by side pens (you can see where they are located on the Nails Creek Campground Map). 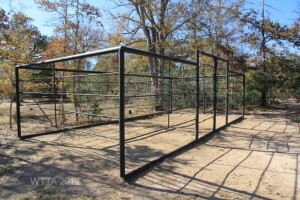 These pens are also made of pipe but they are smaller (maybe 10 by 10 or 8 by 8), the top bar is low which allow the horses to easily hang their head over into the pens next to them, and there is no upper pipe beam to secure a tarp. 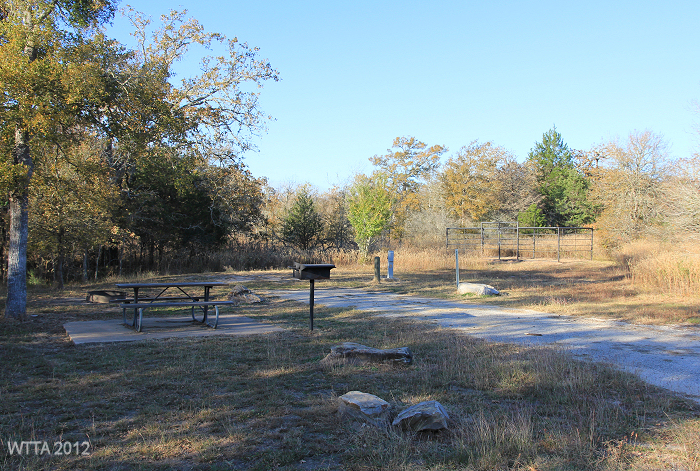 Each site also has a picnic table, fire ring, and grill. Bent Tree also has a bathroom/shower house. A dump station is located just before the entrance to Bent Tree. Leopold is enjoying his shady pen. Notice the high center bar which can be used to attach a tarp. The Bent Tree sites are located on one side of a loop, the bathhouse is on the opposite side of this loop. So if you miss your site, you do not have to back up your rig because you can just circle around the loop. Large rocks sit along the edges of some of the camping sites and are useful as mounting blocks, but be careful not to hit them when backing your rig into the site. The campsites are not squeezed side by side, instead they are pleasantly spread apart. Trees and vegetation fill in the spaces between each campsite and little pathways run between campsites, throughout the campgrounds, and to the bathhouse. At the back of several of the Bent Tree campsites trails lead to the lake, follow the lake shores, and wind around to Cedar Creek. 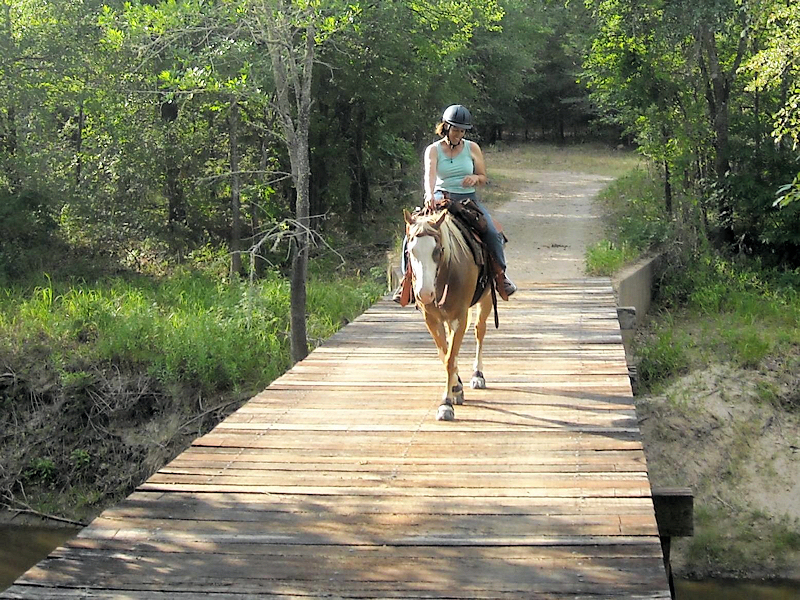 Nails creek also has ten primitive water only equestrian sites for overnight camping. When driving through the park entrance, this campsite is the first left and is near the trailhead. This campsite also accesses the trailway directly. At this campsite there are three pairs of pens and one row of pens exactly like the ones at the Bent Tree campgrounds. At the center of this campground is a handy round pen. This campsite has picnic tables with a pole and hook to hang a lantern on. Some of the pens in both camping areas are not very shady, but you can picket your horse under the trees (use tree saver or an old girth to protect the tree) and let him eat grass during the heat of the day. Some sites have hitching posts and some do not. TETRA does a lot of work with this park to keep the camp area, trails and pens nice. Thank you TETRA! Row of pens at Bent Tree in Nails Creek. Once done with your pen just pile up the manure by the gate and the park staff picks it up! Trail Users: equestrians, hikers, dog walkers, and bicyclists. Horse drawn buggies/carriages are also allowed! Mileage: 13 miles of trailway between Nails Creek and Birch Creek. Terrain: The terrain at Lake Somerville Trailway is not challenging, as it mostly ranges from flat to gently rolling ascents and descants. The majority of the trails consist of a small to medium gravely rock surface and some sand and grass surfaces. Shoes or boots are recommended. 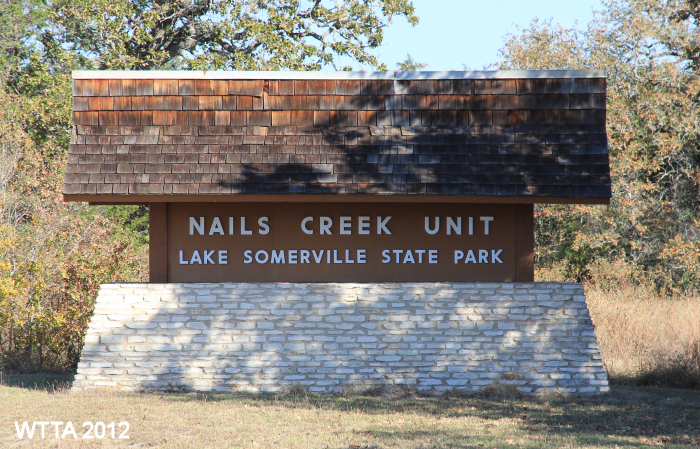 Somerville Texas State Park has a 13 miles of trailway that goes from the Nails Creek campgrounds to the Birch Creek Campgrounds. This is not a loop so you have to go back the way you came making your round trip about 24 miles, unless there is someone who can move the truck and trailer while everyone is riding or have a friend’s trailer at the other campground. The 1/2 way point between campgrounds/trailheads is approx 6 miles and has a nice rest area and view. 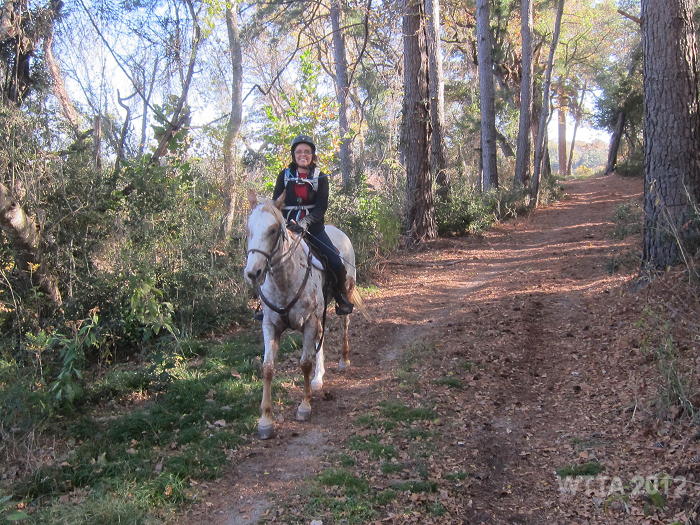 The trailway entrance located at Nails Creek can be a little rocky so I usually use boots as my horse is unshod. They have water at that trailway entrance and approx 7 miles up the trail. Trails are well maintained and rangers are really nice and helpful. 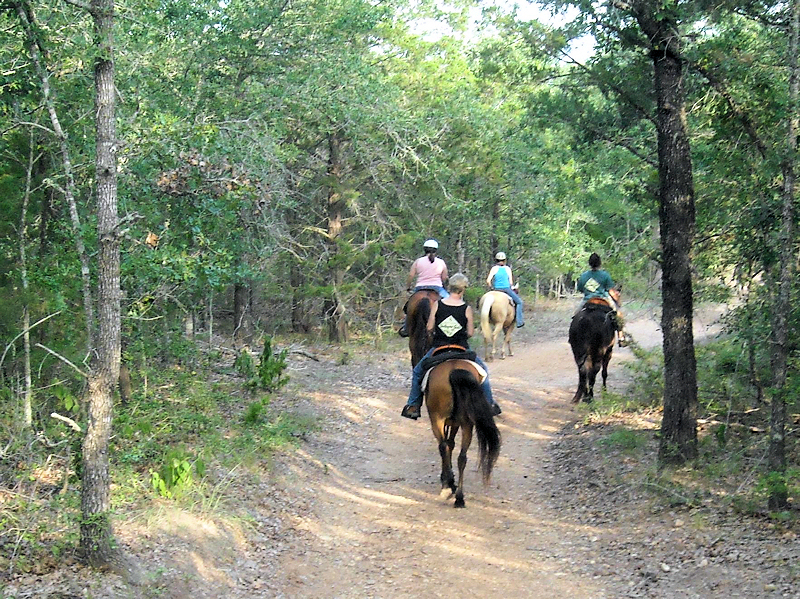 At Nails Creek from the full service campsites you will need to ride your horse down the park’s main road about 1/2 mile to reach the trailway entrance. It is an easy ride with plenty of grassy area on the side to get off the road. On the trail there is a bridge crossing that is fun to do and can be scary. It is narrow and approx 30′ above the water. Most horses are ok with it. It is scarier for the rider I think. 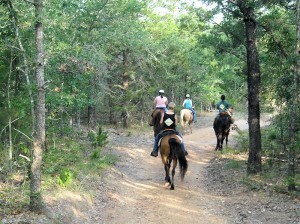 The trailway goes up around Lake Somerville and has a gradual up hill incline. It is not steep, but it is a climb for horses not used to it. The trail is shared with hikers, but they usually just stand off to the side and wait for you to pass. Right off the Nails Creek campgrounds there are also nice grassy trails that are great to do those short rides on and will take you down to the lake area where you can go into the water.